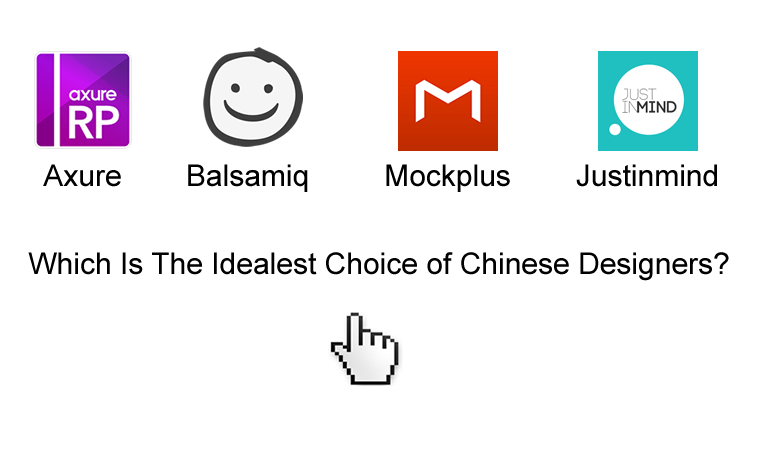 Blog > Design and Prototyping tools >Axure vs Balsamiq vs Mockplus vs Justinmind - Which Is The Idealest Choice of Chinese Designers? Nowadays, there are many prototyping tools on the foreign lands, such as Pidoco, UXPIN, Proto.io 6, and InVision, etc. It makes you dazing when you have so many choices. However, do you know which of them are the common prototyping tools in China? How the Chinese designers think of the performances of them? Generally, there are mainly four desktop prototyping tools in China: Axure RP, Balsamiq, Mockplus, and Justinmind. These four tools technically have taken control of a pretty large number of Chinese users. Today, I'm gonna try to analyze the reasons why those four prototyping tools could have nice performances in China from the view of user experience which is the first thing of "Innovation 2.0". Broadly speaking, the "Axure" we talking about is Axure RP, equaling to Axure Rapid Prototyping. The reason why Axure has a good fame in China is not only the using inertia, but also the comprehensiveness of its function. Such as the setting of judgement and condition. The survey among senior Axure users shows that 80% core users need the judgement setting function. However, the defect of Axure in users experience is also quite obvious. The setting is relatively difficult and lack of visualization. Judgement, condition, repeater and some other functions are pretty hard to learn. But in China, a large number of UI/UX designers haven’t yet reached the level of being master these skills. Although there are so many software developing teams here, usually there are only a few people in each team, the management is still remaining at the startup level, and the speed of software updating is way more important than the request of standard working flow. This should be an important reason for the decrease of Axure users after new prototyping tools show up. In the tools of prototype design, Balsamiq is really special. Why? Because it is the only one prototyping tool that supports sketch instead of the wireframe. 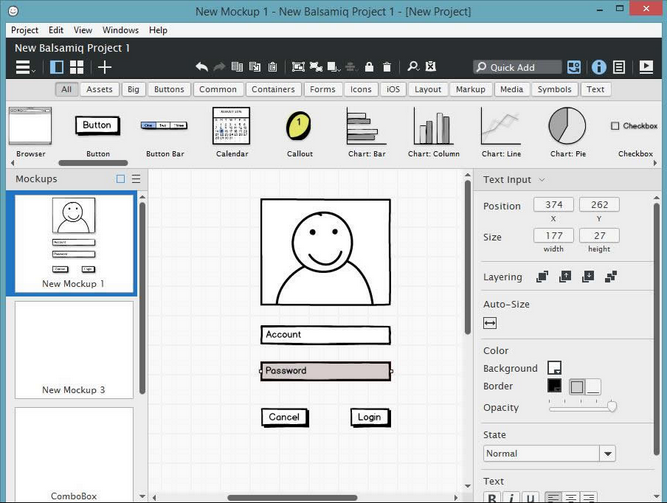 All the components of Balsamiq are in the style of sketch. This is so sweet for the users who love the sketch style. Although this satisfies a minority of users, Balsamiq paid too much for this: the number of components is less than 100. On the other hand, Balsamiq does not support App prototype design and real-time preview. What's more, it has stock at the level of designing static prototype. Balsamiq doesn't have interaction function. This prototyping tool has entered Chinese market since the year of 2009, however, these problems still exist. It makes Chinese users love it but also hate it at the same time. Balsamiq is the first one to publish the sketch style in prototype design, but in recent years, sketch style is not as popular as it was. More users prefer to pay less cost and gain more hi-fi prototypes. As time goes by, users have to give up on it. As a Chinese native software, Mockplus has accumulated a large number of users, only in two years after its release. Chinese designer support their product should be one reason of Mockplus fast growth, but the most important thing is that Mockplus gives the user experience the highest priority. As a prototyping tool, it uses the way of dragging and dropping as the basis of operation. And the high visualization during the operation is another scoring point. Meanwhile, Mockplus supports preview in comprehensive ways: real-time preview, picture, demo package, QR code scanning on App, real-time preview on App, HTML offline package, and HTML previews on cloud. 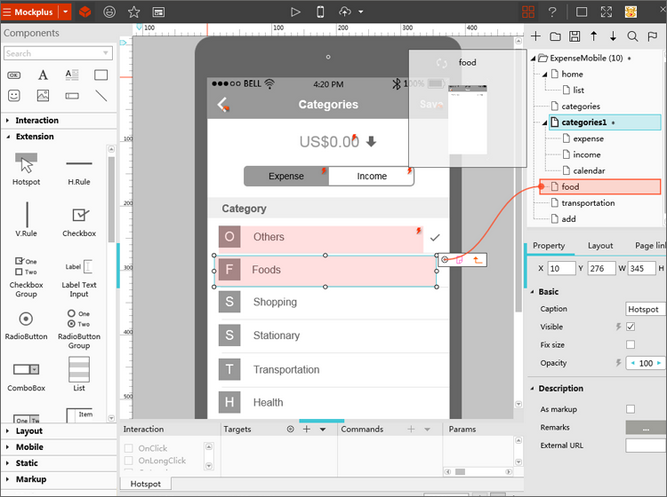 Also, Mockplus supports two styles for designing: sketch and wireframe. Another important thing is that Mockplus' develop team locates in China, which makes the support service pretty good. I have asked some questions in Mockplus official QQ group, and they replied to me quickly almost every time. It is pretty impressive, and of course, it would be very difficult for the software those coming from the foreign countries to do the same. However, Mockplus also has shortcomings. 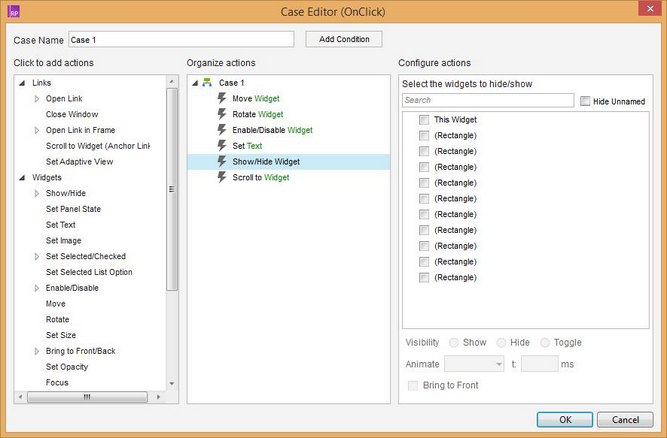 Mockplus doesn't support complicated functions at present, such as judgement and condition. This will cause an influence on the user experience. Besides that, Mockplus is not good at supporting PRD writing. One of the prototyping tools that we shall not ignore in China is Justinmind. The slogan of it is "Prototyping platform for web and mobile apps." In terms of prototyping for App, it is actually doing a good job. 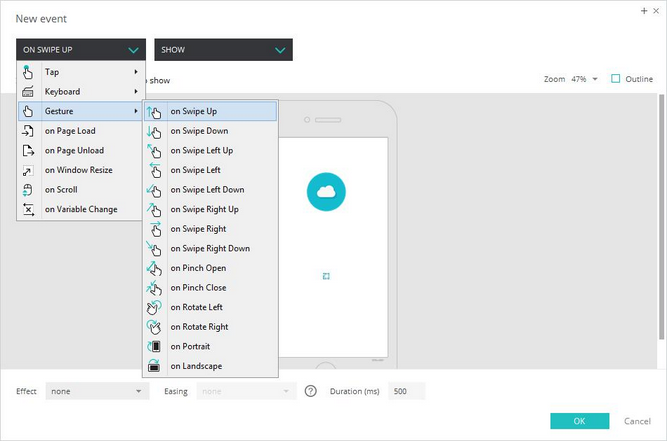 Because, in all these four prototyping tools, Justinmind is the only one supporting gesture interaction. But, Justinmind and Axure have too many similarities in the way of setting interactions. 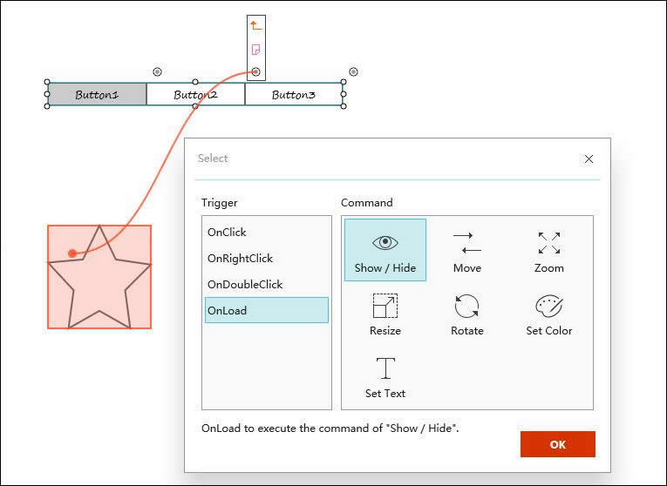 Even though Justinmind has made a lot of improvements at visualization of interaction settings and tries to make it easier for designers, users still have to understand the logical thinking and have some basic knowledge of programming. In China, the number of designers who's qualified for these requirements is not large. Hence, it has kept away many users who are looking for simpleness. Also, Justinmind is developed based on Java, thus the operating speed is the slowest one among these four tools. This could be another reason that Justinmind never really becomes popular in China. Axure has comprehensive functions. It keeps a good balance between simpleness for using and the complexity for function. As a tool which has great experiences, Axure has a large number of users in China, and the influence of using inertia is strong, which makes it very hard for other tools to replace Axure. But, at the same time, we also feel the pressure coming from the decreasing of the Chinese market share. Balsamiq is different from others, as it wants to be shining in another way. However, the low-speed improvement has led lots of users go into others' doors. Maybe, coping with shifting events by sticking to a fundamental principle is also a good way for developing a product. Mockplus is easy to use, simple to set, and it keeps updating in a fast speed. For Chinese users, the support service is always seasonable. Therefore, Mockplus has gained a quite number of users. But, because its design theory is "Faster, Smarter, Easier", it has to sacrifice some relatively complicated function, and this means Mockplus has to give up this part of users. As for Justinmind, I think it's sort of "Frenemy" with Axure, as they have so many common features. In terms of App designing, Justinmind has a strong advantage. However, the number of users who have mastered Justinmind is only minor. In a conclusion: Each of the prototyping tools could only solve one problem, there is no Mr. Perfection. I hope those four softwares could seize the advantage, and have better performances in the Chinese market in the near future.